Yep, it's that time of the year again as movie exclusive merchandise image leaks are bound to pop out and this time, it reveals the upcoming movie exclusive Gashats, Level-Up forms, movie Rider and Brave's ultimate form! 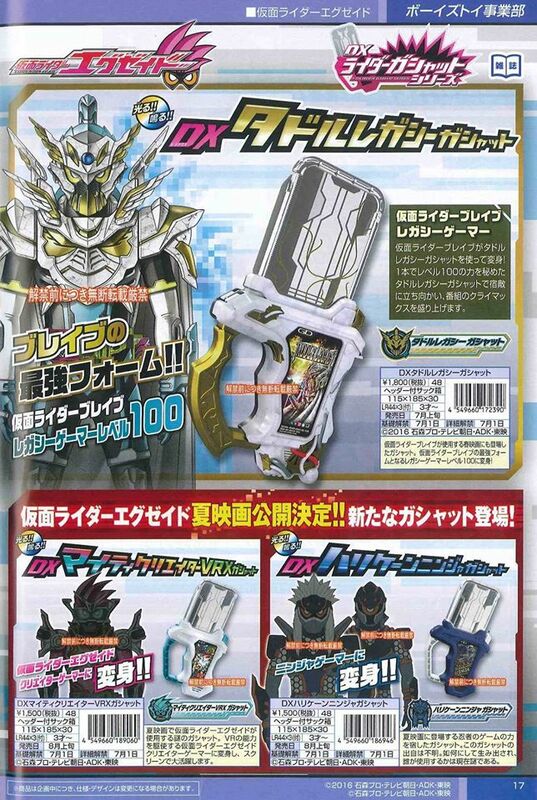 Seen in the image above is the confirmation image that we will be seeing Kamen Rider Brave's ultimate form (as he is stuck in level 5 because Snipe is hogging their Gashat Gear Dual). Introducing the Taddle Legacy Gashat which gives Brave the power to achieve his ultimate form, Kamen Rider Brave Legacy Gamer Level 100. Will be released in July 2017 for 1,800 yen. Next we have EX-Aid's movie exclusive Level-Up form called Kamen Rider EX-Aid Mighty Creator Gamer and this can be achieved by activating the Mighty Creator VRX Gashat which will give him virtual reality fighting abilities. Lastly, we have the still unnamed movie exclusive Rider called the Ninja Gamer whom is the user of the Hurricane Ninja Gashat (hmmm looks like shinobi's old look from the old sega genesis games). Both movie Gashats will be released on August 2017 for 1,500 yen. Wait, I'm confused. Isn't Taddle Legacy exclusive to the super hero taisen movie? And also used by a fake Hiro? Even if it looks like a repaint of Taddle Fantasy, Brave's level 100 looks sleek and fits the theme really well. It's good to see that other characters can receive power ups and focus (take notes, Kyuranger). I still hope that Taiga receives a level 100 form too. So, if Brave's final form is level 100, I'm guessing Muteki Gamer is gonna be some ridiculously high level, like "infinite" or "beyond 100" or something. Wait, isn't Taddle Legacy a Level 50 Gashat (see Cho Super Hero Taisen)? How the heck Hiiro is going to achieve Level 100 with that? Ninja? Who doesn't love ninja? Especially with mono eye!! So taiga will die ?? they seem to be really love brave. first they gave the whole "mid-upgrade side effect" to him when snipe clearly do not have any symptom whatsoever, no explanation given. while brave is stuck with drago knight hunter, he is using full form of it no problem, which is already a plus. who can forget how he defeated fantasy gamer without transforming, and how awesome that form is to him! and he even uses hunter gamer against more dangerous foe like it was nothing. let's not talk about how important he is in chou super hero taisen. idk how much screen time he has, but the fact that not only there's an evil rider version of his (before ex-aid even have an evil rider), but he also has a form exclusive to himself while ex-aid go play giant with kyuranger somewhere else. owh, and he just turn more and more likeable as the series go. remember how specter seems to be pushed aside to the point of being redundant? not that i am complaining. in fact, i love it! So Taddle Fantasy and Taddle Legacy is like Final Fantasy 4, where Cecil turns from Dark Knight to Paladin? So maybe he will get a final form in his V-Cinema movie, like Specter last year? His equivalent to Muteki Gamer, just like Sin Specter is to Mugen Ghost. Maybe Taiga will get a level 100+ in his V-Cinema also. It's probably Taddle Quest + Legacy, rather than just Legacy by itself. That's why it becomes Level 100, rather than 50.